You can help us reduce hate online. Tell companies it's time to change the terms. Tech companies must adopt more comprehensive corporate policies to combat online extremism and hate. These policies should have clear and transparent terms of service. I urge your company to adopt and implement the set of corporate policies outlined by Change the Terms. Following the deadly events of the Unite the Right rally in Charlottesville, Virginia, on Aug. 12, 2017, the tech industry finally started to take real steps to address the spread of hate speech online and the ways their platforms are used to organize, fund and recruit for White supremacists and other hateful movements. ‍But the industry needs to do more to protect people of color, women, LGBTQ people, religious minorities and other marginalized communities. For the past year, Change the Terms — which is made up of civil rights, anti-hate and open-internet organizations — has been working on a set of corporate policies to help tech companies stop hate and extremism online. We have shared these policies with tech giants like Facebook, Google and Twitter. Now is the time for all tech companies to take a stand against hate on their platforms. 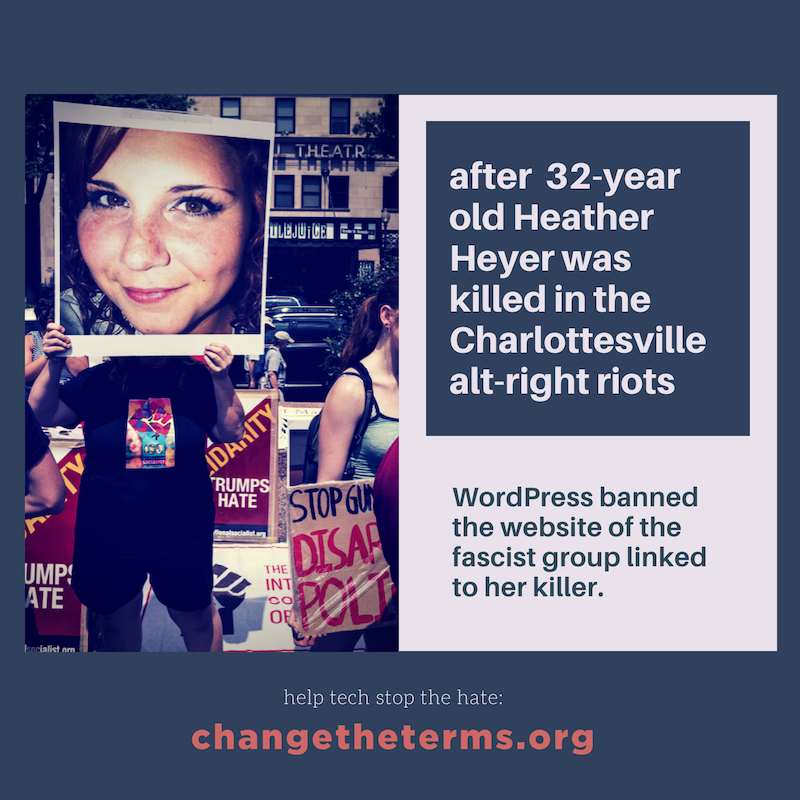 The corporate policies that Change the Terms created are intended to help internet companies reduce hateful activities that are taking place on their platforms. By implementing and following these policies, tech companies can help stop the spread of hateful activities via social media, web hosting and online financial transactions. Join us: Call on tech giants like Facebook, Google and Twitter to lead the industry in stopping online hate. Sign the petition urging tech companies to adopt and implement the comprehensive corporate policies put forward by Change the Terms. Please share my name and email address with the Change the Terms coalition members, so that I can receive updates on this campaign and others.